I would like to begin by defining the term, “LOVE” from my new book title, Love Speaks: 21 Ways to Recognize God’s Multi-Faceted Voice. “I HAVE LOVED YOU with an everlasting love; therefore I have drawn you with lovingkindness” (Jeremiah 31:3). So just how does a Christian spell the word LOVE? This word is unique to the Christian’s understanding of God. Why? For the ancient Greeks (and the modern world) the words that describe love include a variety of ways like friendship, or love for a worthy object, like a sports team, or a worthy person, like a spouse or a child. The revolutionary event of the cross of Jesus Christ reveals a revolutionary love that is as impacting in modern times as it was then. “Agape is a love for the unworthy, for one who has forfeited all right to the lover’s devotion,” writes Bruce Milne. “The Old Testament has witness for this in God’s love for Israel, and in Hosea’s love for his faithless wife. “Holiness and love conjoin perfectly in the person and work of Jesus Christ. As God, He embodies divine holiness that is separate from and resistant to all sin and evil, yet His very coming is God’s loving, gracious response to human guilt and helplessness. Revolutionary, yes? So Paul writes, “But God demonstrates His own love (agape) toward us, in that while we were yet sinners, Christ died for us” (Romans 5:8). LOVE is GOD’s LOVE, as GOD IS LOVE (also see 1 John 4:7-19). 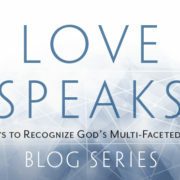 This final portion of this blog is an excerpt from Section 4, the practical application section of Love Speaks. While it is true that every week, God is reaching out in certain ways to speak TO you, as a loving Father He is also speaking words OVER you. Words that help you understand that you are loved and beloved! “This is My beloved Son” said the eternal, loving Father to His Son. And His Son in turn reveals the Father’s agape love to all who receive Him. You are God’s BELOVED son or daughter, prince or princess of the King. Know it. Trust it. And live it. In your prayer life, expect the Father to listen and respond to your prayers, and speak wonderful, truthful words OVER you. 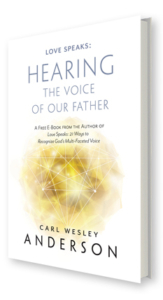 In my experience I (Carl) have found I needed a new ability in my relationship with the Holy Spirit within to work together with Him in hearing His voice. Every morning I prepare myself in both prayer and reading of the word, expecting the Lord to guide me, however He chooses to do so, and if indeed He chooses to do so on any particular day. Some days there seems to be no contact from God, and other days there seems to be multiple different contacts and thrilling moments of His voice personally speaking and confirming my path. Bruce Milne, Know the Truth: A Handbook of Christian Belief, pg. 139, InterVarsityPress, 1982, 1988. Sarah Young, an excerpt from March 28, Jesus Calling: Enjoying Peace in His Presence, Thomas Nelson Publishers. https://borntoblaze.com/wp-content/uploads/LS-WordPressHeader.jpg 372 672 Carl https://borntoblaze.com/wp-content/uploads/2015/05/BtoBLogo-Web-125-matt.png Carl2016-09-06 18:29:102018-10-23 12:56:45Love Speaks: How Do We Spell, "LOVE?"